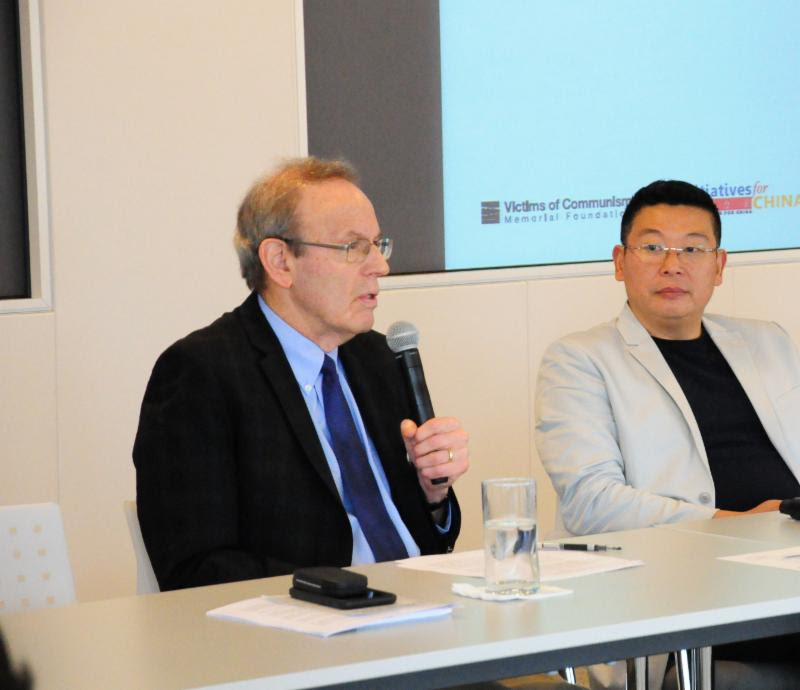 Carl Gershman, President of NED, spoke at “Exploring the contested history of the Tiananmen Massacre,” an event hosted by Initiatives for China and Victims of Communism Memorial Foundation at the PEW Charitable Trust conference facility on June 3, 2016. Last year, when I spoke to the Inter-Ethnic Leadership Conference organized by Initiatives for China, I opened my remarks by quoting from an article by David Shambaugh that had just appeared in The Wall Street Journal on what he called “The Coming Chinese Crack-up.” Shambaugh, who has since developed the article into a book entitled China’s Future, gave five reasons for thinking that the Chinese regime suffers from systemic and ultimately fatal weaknesses: 1) The wealthiest Chinese citizens are parking their money abroad and are thinking of leaving; 2) there is increasing repression that Shambaugh considered to be a sign of weakness, not strength; 3) the regime was ideologically bankrupt; 4) It could not deal with the massive problem of corruption that is rooted in the authoritarian system; and 5) the reform process had reached an impasse, meaning that if the regime couldn’t adapt and modernize, it would fail. The evidence for the regimes insecurity can be found in Xi’s concentration of power in his own hands and the growing cult of personality that he has promoted. The Economist writes that Xi is now not the CEO (the chief executive officer) but the COE, the “Chairman of Everything.” He’s the head of state, the leader of the Communist Party, the commander-in-chief of the armed forces, the head of the security services, the head of the committee in charge of the so-called “comprehensive reform,” and also the person in charge of the economy. He has abolished the practice of “collective leadership,” which was adopted in 1982 to prevent a return to the totalitarian terror of Mao’s unchecked dictatorship, which produced such horrors as the Cultural Revolution when tens of millions of people were tortured and humiliated and two million people were killed. It was a period of ideological madness that has been called a “spiritual holocaust,” yet Xi has promoted a cult of Mao and called any criticism of Mao “historical nihilism” that he fears might undermine the legitimacy of the party. Xi has overseen the harshest crackdown on dissent since the Tiananmen massacre, arresting lawyers, academics, workers, and civil society activists, and tightening controls over the media and access to the Internet. But with all the repression, he has not been able to silence criticism. In March, just as China’s rubber-stamp parliament was gathering in Beijing, he was the target of an open letter that appeared on a state-run website criticizing his concentration of power and personality cult and calling upon him to resign. Another attack appeared on the website of the party’s own enforcement arm. It called for more debate and freer speech and warned Xi that the thing to fear is not people saying the wrong thing but “people not speaking at all.” Nathan wrote that this remonstrance was a more severe warning than the open letter. Xi knows he’s vulnerable. He said soon after assuming power in 2013 that if the party “can’t handle food-safety issues properly, and keeps on mishandling them, then people will ask whether we are fit to keep ruling China.” Yet Xi has presided over a slowdown in economic growth, a ballooning debt that is now 280 percent of the gross domestic product (it was 135 percent just seven years ago), a disastrous collapse of the stock market, and now an enormous public-health scandal involving, as The Economist has reported, the sale for tens of millions of dollars to government health centers of “black-market, out-of-date and improperly stored vaccines.” Clearly, by Xi’s own standard, China’s Communist Party is not fit to rule. We should not pretend to be able to predict the future, but there is little doubt that China’s Communist Party faces a growing political crisis. In an interview in The New York Times earlier this week, Shambaugh said that the party “must learn how to share power in order to maintain its power. Political hegemony is a certain recipe for relative economic stagnation, increasingly acute social stresses and accelerated political decline of the regime and system.” But there are no signs that the party will share power, so 27 years after the Tiananmen uprising, we need to begin to think about the possibility of a new challenge to the party dictatorship in China and maybe even a new opportunity for a political opening. It is one of the remarkable coincidences of modern political history that the massacre in Tiananmen Square occurred on the very day – June 4, 1989 – that Poland held the legislative elections that led to the downfall of communism in Europe. There has always been a relationship in my mind between these two historic events – one that succeeded and led to a democratic opening, and the other that seemed to fail and allowed the dictatorship in China to preserve and consolidate its power. But perhaps the Tiananmen uprising was not the failure that some think it to be. I am reminded of something said to me in 1987 by the great Polish philosopher, Leszek Kolakowski. In reflecting on the crushing of the Solidarity movement in Poland in 1981 and other failed uprisings in Central Europe that, like the Tiananmen uprising, were forcibly repressed – the uprising in East Germany in 1953, the Hungarian Revolution in 1956, and the Soviet invasion of Czechoslovakia in 1968 – Kolakowski said that while these freedom movements were repressed, they were not in the end defeated because they succeeded in raising the plateau from which future uprisings would take place. Lessons were learned, movements matured, the power of the dictatorship was eroded, and eventually democracy was achieved. I think the same thing can happen in China, and here we can take another lesson from the Polish experience. In 1976, in the wake of protests by Polish workers over economic conditions and price hikes, a group of Polish intellectuals formed the Committee for the Defense of Polish Workers, with the initials KOR. It was this alliance of Polish workers and intellectuals – with the support, of course of the Catholic Church and Pope John Paul II – that led to the emergence of the Solidarity movement in 1980. I don’t know if a similar process is possible in China, but this is something we – and especially you – will need to think about and possibly plan for in the period ahead. Over the past several decades, China has developed a relatively small but growing middle class, which was the subject of a lecture delivered to the NED last year by Andy Nathan in memory of the political sociologist Seymour Martin Lipset. The lecture was entitled “The Puzzle of the Chinese Middle Class” and was just published in our Journal of Democracy. The Chinese middle class is a puzzle, according to Nathan, since it is not now playing the kind of democratizing role that Lipset believed the middle class can play in the context of rising standards of living. To do this, Chinese intellectuals and activists, who are a political voice for the middle class, must begin to organize themselves and take actions that address the needs of the Chinese workers and peasants. The growing economic crisis in China, and the failure of the Chinese government to adopt meaningful social and economic reforms, create a context in which Chinese activists can begin to explore alliances with the society’s lower classes. It is a context of contradiction in which the regime’s legitimacy, which has been based on economic performance, has been diminishing even as the regime is tightening political controls, which further contributes to economic stagnation and the deepening crisis of legitimacy. It is a context of contradiction in which the regime campaigns against corruption but systematically encourages it by prohibiting the mechanisms of legal, media, and electoral accountability that are necessary to fight corruption. And it is a context of contradiction in which the regime’s economic policies encourage migration to the cities, while its refusal to reform the hukou household registration system has denied rural migrants access to social services in the cities, thereby creating a deep and sharpening social divide. As the pressures for change grow, the Chinese activists and intellectuals will need to broaden the social base of the opposition, and they can do that by developing ideas and programs that address the growing and complex needs of Chinese society. The government and various demagogues will try to divert social discontent by channeling it into a malignant nationalism directed against ethnic minorities and foreign countries. That is a recipe for real disaster for China and the world. The people who protested and died in Tiananmen Square need to be honored and memorialized, and I therefore applaud Yang Jianli and Initiatives for China for launching a campaign to inscribe the Tiananmen Massacre on the UNESCO Registry of the World Memory as a permanent repository for an official record of that historic expression of the human yearning for rights, dignity, and freedom. I am proud that a replica of the Goddess of Democracy, that was erected in Tiananmen Square, is what the NED annually gives to recipients of its Democracy Award. Like the Tiananmen uprising, the Goddess of Democracy is a universal symbol of the human aspiration for freedom. I also applaud the campaign to seek the truth about the two Tiananmen Tank Men who by standing in defiance in front of approaching tanks gave the world another symbol of courage and heroism. But it’s also necessary now to build upon what was started 27 years ago, when masses of Chinese citizens called for the rule of law and respect for basic human rights and freedoms. The activists in Tiananmen Square took an historic step towards democracy, and there is no turning back. Their legacy is the call for rights, and now that call must be linked to a new vision for addressing the social and economic needs of the Chinese people. Those needs cannot be addressed without political freedom. The challenge now is to build new coalitions based upon the indissoluble link between liberty and equality, between rights and needs. That is the way to honor the memory of those who gave their lives for democracy 27 years ago in Tiananmen Square.